First up – posters. 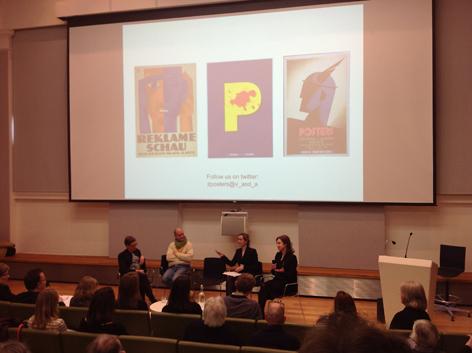 On 1st March I attended a conference at the V&A entitled ‘Posters: Collection, Creation and Context’ in which ‘artists, designers and academics explore the past, present and future of the poster’. The one-day conference had a an interesting and varied mix of speakers, one of whom was our own Curatorial Director Catherine Moriarty. The points and questions that stuck to mind were just as varied as the speakers. I ended up mulling over thoughts about the poster as an artistic object versus its effectiveness – where modern posters in particular are more infographic than ‘artistic material’. Posters have always been about mass communication; reaching as many people as possible. As the way in which we ‘mass-communicate’ has changed a lot even in the last ten years alone, the technology of the poster is also changing. The very interesting question that was raised is how much is digitization of these materials is also changing the poster historically? I also found it very interesting listening to people such as David Gentleman where I started thinking about graphic designers taking on commissions where your personal views might go against the company you get commissioned by – respect for the company you design for or financial advances? First panel discussion at the conference showing (from left to right) Line Hjorth Christensen (University of Copenhagen), Paul Rennie (Central St Martins), Catherine Flood (V&A) and Catherine Moriarty. In other poster news, it is Icograda’s 50th anniversary this year and there are some very exciting rumblings going on to celebrate this, but more on this soon… I am still working with the Icograda posters and without wanting to jinx anything, the digitization of the materials is coming to an end. Some of the posters we photographed back in 2006 may well have to be re-digitised as our digitisation standards have changed for the better since then. However, we now have approximately 1800 large format posters digitised and with our archivist Sue Breakell, I am in the process of ‘cleaning up’ the existing database records compiled about 10 or so years ago – no mean feat! The biggest challenge we have faced with this task has been adding access points to the poster records to create a working search system. Information on the posters is extremely varied which has also made this problematic – some have detailed information about designers, corporations involved etc where others we have only been able to add an access point for the country of origin, putting it under a generic ‘poster’ subject heading. We are also trying to catch willing translators for selections of the international posters, so if you happen to have a specific language skill, do get in touch as we may well need your help! I should also mention that at the moment the database is only searchable internally but we are hoping that with a little bit more time, we will have all of the posters up on the Archives Hub. There is a taster online already in form of the Finnish posters in our collection, so do have a sneak peek! And to slightly stray from subject whilst talking of things Finnish, the ‘SA Kuva-Arkisto’ in Finland have digitized 160 000 photographs in their Archive of Finland during WWII. I am going off on a slight tangent here, but the photographs are absolutely stunning, if war photographs ever can be. So I would highly recommend looking at them – petapixel.com has an entry introducing the collection. 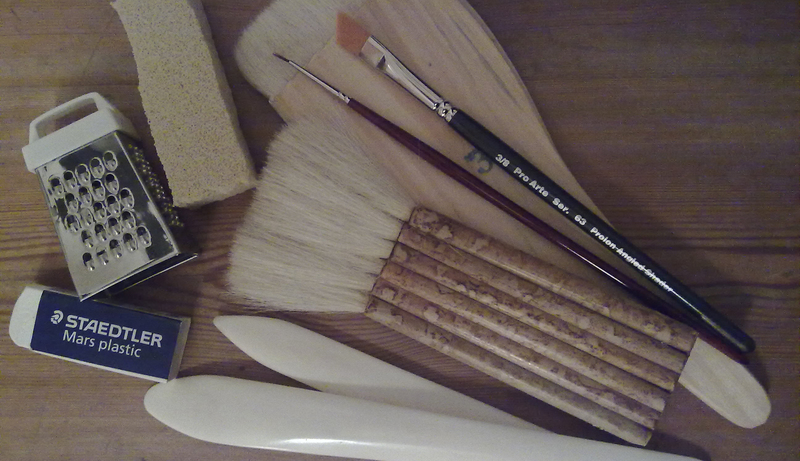 Next up – exhibitions. As a shameless plug, some of the materials from the Barbara Jones archive are on show at an exhibition entitled ‘Black Eyes and Lemonade: Curating Popular Art’ at the Whitechapel Gallery. The exhibition was curated by Catherine Moriarty and the Director of the Museum of British Folklore, Simon Costin. We took a staff trip up to see the exhibition a few weeks back and it is definitely worth a visit – absolutely gorgeous collected pieces on show from not only us, but also the Vogue Archives and the Whitechapel Gallery Archive. And last but not least – conservation talk! To be more specific; textiles conservation. In the Design Council Archive, we have two carpet samples of award winning carpet design from the 1950s. It is very unusual for us to have any kind of objects in our collections, so having these two squares is rather lovely. The sample on the left is an award winning design from 1957 by Lucienne Day, made by Tomkinsons Ltd. The pattern is quoted to have been chosen as a winner ‘because of the sparkle and contemporary character of its pattern which, on account of its scale, is admirably suited to the small sized house’ in the booklet ‘Designs of the Year 1958 and 1957’ published by the Council of Industrial Design. In the same booklet, the design on the right by Artkurl Wilton (1958) manufactured by William C. Gray & Sons Ltd is described as ‘a useful inexpensive Wilton broadloom carpet that meets the demand for something more interesting than plain body carpet and yet which, through an unobtrusiveness of the pattern, would not dominate a small room’. We have delivered these gems to a local textiles conservator Zenzie Tinker for some TLC. They appear to have moth damage and to make sure nothing is live, which it does not appear to be, they have been frozen and are awaiting further treatment. I am hoping to go and document the conservation of these carpets with a blog entry in mind, providing the timings work out. And to finish off this rather epic entry (hope you are still with me here! ), I would like to mention that there will be more musings from me in June as I was very lucky to be successful in a funding application for a grant through the Clothworkers Foundation’s Conservation program. This means that with the support of the Design Archives as well, I will be attending West Dean College mid-June for a course entitled ‘Preventive Conservation’. Very excited indeed! Would love to hear more about what all the speakers had to say at that conference! It was very thought provoking indeed – you can find out more about who was speaking on the V&A website (http://www.vam.ac.uk/whatson/event/2216/posters-creation-collection-and-context-3490/). David McCandless’ work was very inspiring – do check him out as well if you haven’t already.